Barbara Weibel is one of my favorite travel bloggers. Barbara puts the focus on writing incredible posts with sometimes startling insights into the world of travel and culture. On top of that, she is one of the most positive people out there. Read on to see why this is one of my favorites and Barbara will soon be one of your favorites as well. Vagobond: Barbara – I love your blog. Everything from the symbolism of the name (full on the outside, empty in the middle in reference to your former careers – “solid on the outside, empty on the inside”) to your amazing photography and insights into the people and places you travel. All of this made me wonder – did you have a background in anthropology? Barbara Weibel: Interesting that you should ask that. The short answer is no, however I’ve always thought that if I could do life over and choose another career, I’d go into a science field. I’ve been a rockhound ever since I was old enough to pick up stones and still comb through mine tailings whenever possible, so I consider myself an amateur geologist. I’m also fascinated by culture and could easily have been an anthropologist or archeologist. Frankly, I’ve got enough knowledge to be dangerous but I also have an insatiable curiosity; it’s a great combination for a writer. Vagobond: You travel to a lot of off the beaten path places as a solo female traveler. What kind of challenges do you face in that regard? Barbara Weibel: To date, I really haven’t faced any major challenges that specifically have to do with being female. I suspect that my age may be a factor in that regard, as these days I seem to garner more respect than I did as a young female traveler (when I was younger I had to fend off unwanted attention from men, but that’s not much of a problem any more). Of course, I haven’t traveled to any of the countries where women are severely oppressed, such as not being allowed to drive or go out in public alone. It’s probably a good thing I haven’t; I have little patience for that kind of thing and I’d probably push the boundaries and end up in trouble. I also think that being an experienced traveler makes a big difference. With years of perpetual travel under my belt, I have certain routines that serve me well and I’ve learned to never ignore my gut. If I feel like I’m in danger or need to leave a place, I do so; if I feel a certain person is not trustworthy, I extract myself from the situation immediately, even if it means being rude. But having said that, I also don’t travel in fear. Most people are good and will bend over backwards to help, and I’ve learned to trust my instincts. Vagobond: You stay a minimum of a month in your chosen destinations. Can you explain why? Barbara Weibel: When I originally fled corporate life to pursue my passions for travel, writing, and photography, I’d just recovered from a serious illness. I thought I might die without getting to do all the things I’d always dreamed about. I promised myself that, if I recovered, I’d walk away from corporate life and backpack around the world. I did eventually recover and set out on a six-month round-the-world trip, determined to see as many places on my travel wish list as possible; as a result, I crammed 16 countries into six months. Gradually, I realized that I was fascinated by culture and by the fact that, despite differences in dress, traditions, food and religion, people all over the world are all more similar than we are different. As my writing delved more deeply into cultural issues, I found myself staying longer in each place in order to immerse in the local scene. At the same time, I discovered that I enjoyed my travels much more when I formed a local connection. Vagobond: I remember when you wrote about holding the Dalai Lama’s hand – are you a Buddhist? How did you become Buddist? Barbara Weibel: I’ve been a “seeker” all my life and have read fairly extensively about most religious and spiritual traditions, but my first real contact with Buddhism came during a trip to Thailand in 2002. That trip confirmed that Buddhism was the spiritual philosophy that resonated most strongly with me. However, it took me a number of years and much more study to choose a particular Buddhist tradition. Theravadan Buddhism, which is practiced in Thailand and most other Southeast Asian countries, is considerably different from Chinese Buddhism, Zen Buddhism practiced in Japan, and Tibetan Buddhism. During my first trip to Nepal, about two years ago, I finally had the opportunity to study Tibetan Buddhism with the Tibetan refugee community and quickly realized it was what I’d been looking for all along. The day last summer when the Dalai Lama held my hand and looked directly into my eyes was one of the most incredible experiences I’ve ever had and I will treasure it always. Vagobond: Your travels are intimately connected with the people in the places you go – can you share how you go about making these connections? Barbara Weibel: I don’t really know how they happen, they just do. Sometimes, it’s like an invisible force is making my travel plans. I cannot count the number of times I have arrived someplace on a whim, with no reservations and no idea what is happening, only to find that a major celebration of some sort is underway. Of course, my innate curiosity is partially responsible, as I will talk to absolutely anyone and am constantly asking questions. But I can’t explain, for instance, why the city fathers of Alausi, Ecuador, climbed out of the bed of a pickup truck that happened to stop in front of me and subsequently invited me to be their honored guest at an Independence Day celebration of the indigenous Quichua community. Things like that happen to me repeatedly, in every corner of the world. I really think the key is being open and following my instincts. Vagobond: How do you feel that technology and the internet in particular have changed travel? Do you have any predictions for the future of travel? Barbara Weibel: I believe that technology and the Internet have had the most significant effect on travel since the days of the early explorers. We can literally learn about any corner of the earth sitting in our living rooms. The drawback is that there are very few, if any, undiscovered places left on the face of the earth, which is one of the reasons I believe cultural travel is gaining in popularity. With no new places to discover, modern day explorers are turning to the peoples of the earth for new experiences. Frankly, I believe that only good can come from this. I am passionately committed to the idea that travel has a huge potential for effecting world peace. I have always believed that the better we know one another, the less likely we’ll want to kill one another. Vagobond: Nepal has been on my list of future destinations for a long time. I sometimes worry that by the time I get there, it will have been eaten up by modernity…you’ve spent a lot of time there – is Nepal changing? Is that a good or bad thing? Barbara Weibel: Nepal is changing, but very, very slowly. Unfortunately, the caste system is still a very real part of the social structure. Add to this the political instability that the country has experienced in recent years and the rampant corruption, and you begin to see why the wheels of change grind so slowly. My fervent hope is that Nepal can move toward modernity without abandoning their rich cultural heritage and strong family values, as these are two of the things that I most treasure about the country that I consider my adopted second home. Vagobond: Can you share three travel tips that Vagobond readers may not have heard? Barbara Weibel: 1) Forget about Travelers Checques; they are virtually useless as they are extremely hard to cash in many places. Instead, use your ATM card once you arrive in a country. Not only will you avoid having to carry large amounts of cash but you will also avoid currency exchange fees, and your bank will give you a better exchange fee than any money changer. 2) If you travel to a country where you don’t speak the language, be sure to pick up a few business cards from the hotel when you check in. Then, when you’ve been out sightseeing all day, you need only hand a card to a taxi driver, rather than try to find someone who speaks English. And in that same vein, use only legal taxis in foreign countries. The front desk clerk at your hotel should be able to tell you how to identify legal taxis and can call one for you; when returning to your hotel, if you are in doubt, use a taxi waiting in front of any large hotel, as they will undoubtedly be legal operators. 3) If you are on a budget, consider hostels as an option for accommodations. Most now offer private rooms in addition to dorms, and hostels are a wonderful way to connect with other travelers who are only too happy to share tips about the best local places. Vagobond: We were both part of Lonely Planet’s ‘Around the World with 40 Bloggers’ – are there other books in your future? What about other places where readers can find more of your writing? Any compilations? Barbara Weibel: I have been working on a memoir off and on for the past 5 years, but haven’t been able to complete it because I’ve been consumed with perpetual travel and building my blog. However, one of my goals this year is to finish the book and, hopefully, get a publishing contract. I’m headed back to Nepal in early April for two months, and I’ve carved out that time to focus on the memoir. I also have plans to publish an anthology in ebook form about my favorite travel experiences, but don’t have a time frame for that just yet. Vagobond: Do you earn your living from Hole in the Donut? What has been the most challenging part of becoming a successful travel writer/blogger? Barbara Weibel: Though I earn a bit from the occasional freelance article or photograph sold for publication, Hole In The Donut is my primary source of income. I earn enough from advertising to keep me on the road full time, although not in luxury digs by any means. Without a doubt, the most challenging part of becoming a successful travel blogger is the time versus money issue. In order to sell advertising, I have to be highly ranked by Google, which brings traffic to the site. Good Google ranking comes from producing high quality, original narrative writing, but also demands a concerted social media campaign, good search engine optimization techniques, and staying in touch with my peers in the travel blogging community, all of which takes time. And that doesn’t even begin to address the more than 100 emails I receive and answer each day and the hours it takes to download, categorize, label, and review the 200+ photos I take each day. By the time I dig through the business end of blogging, I sometimes find it difficult to flip into right-brain mode and write creatively. Vagobond: Barbara – what is a question that I should have asked you? And more importantly – what is the answer? Barbara Weibel: Having given up almost all material comforts in your life, after five and a half years of travel, do you have any regrets? I absolutely love what I do and don’t have a single regret. Despite the constant need to be frugal, I still wake up every morning and can’t wait to talk to the next person, ferret out the next story, and snap the next incredible photo. I spent 35 years in corporate life, earning tons of money and hating every day of my life. Now I have very little in the way of material possessions but I’m happier than I’ve ever been. I’m living proof that it’s never too late to pursue your true passions. Exclusive content, monthly travel deals, and more. Just fill in your email and hit subscribe. Our mission at Vagobond is to make your life and your travel more fun and extraordinary. We love quirky adventures, offbeat luxury, and fabulous food and drink - but we're open to whatever travel might bring. We hope our award winning writers and photographers can help make your travels more meaningful and life-enhancing. 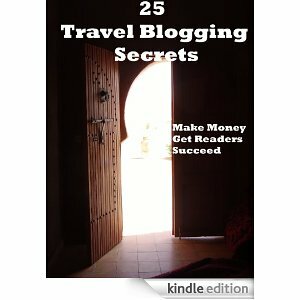 Make money with a travel blog. Off the Beaten Track in Paris - Get your Baton in Gear!